The soap shampoo experiment reminds me of those good old days. Partially because I've been using vinegar, but mostly because I just had to get creative in the shower. In case you're wondering why I'm trying this experiment, my post on detergent based shampoos vs. soap based shampoos will clear some things up. To summarize: It is much, much easier to find a soap shampoo, without additives that are harsh on your hair and health, than a detergent shampoo. The soap shampoo also wins in terms of price. My choice soap shampoo was Bubble and Bee's Lemon Shampoo. It only contains oils and saponified oils, is 75% organic, and smells like lemon merigue pie (swoon). The first ingredient in most shampoos is water. Yep, that's right. Go check your bottle. That's the main ingredient you're paying the big bucks for. Bubble and Bee's shampoo, on the other hand, doesn't contain any water. This is great for two reasons: 1) you get a lot more for your money, and 2) water allows bacteria to grow, which means without it, you don't need an ugly preservative, like parabens or phenoxyethanol. I got a foamer bottle to go with it, so I could dilute 1oz of concentrated shampoo with 5oz of water. That meant that I was paying only 37 cents per ounce! The procedure I followed in the shower was simple. First I washed my hair with the shampoo, and then rinsed. Instead of conditioner, I used 4oz of white vinegar diluted in 10oz of water and poured the entire bottle over all my hair. The reason for the acidic rinse is to return your hair to it's natural pH of 5 after the alkaline soap shampoo. Then I rinsed out the vinegar, and I was done. The vinegar really surprised me. It was probably better than conditioner at detangling hair! The experiment was not just as simple as that, however. Bubble and Bee warns that there is a detox period for hair, usually 2 weeks, but sometimes more. Your hair will shed the waxes and silicones in traditional conditioners that are used to coat the hair shaft and hide damage. Your scalp will also have to readjust because it has become accustomed to overproducing oils to compensate for the harsh and damaging detergents that most shampoos use. This translates to: your hair will be dry at the ends, oily at the roots and you might have product dandruff. Luckily, I didn't have any product dandruff (phew!). However, my hair was greasy on top and dry on the bottom. It helps to moisturize your ends with whatever you use as a leave in conditioner, like argan oil, jojoba oil or coconut oil. Before embarking on this adventurous experiment, I had read the warnings that soap shampoo is more difficult if you have hard water. The minerals in hard water can deposit in the soap and leave a film on your hair, making it perpetually greasy. I blithely ignored this information, because I knew the bay area had soft water. Man, I really wish I hadn't. After my greasiness continued for far too long, I finally wondered if it could be due to hard water. It turns out that my water, according to the local municipal utility district, has a water hardness of 0.8-1.8 grains per gallon (the highest number I saw was 30, but the scale may go even higher, which means my water is pretty dang soft on the scale of things, but not 100%). If you have hard water there are a couple choices: install a water softener into your shower head, or mix your shampoo with baking soda (I told you that the ingredients for a science fair volcano were in here!). So I decided I had nothing to lose, and tried the baking soda route. The next time I showered I added about a tablespoon of baking soda to my shampoo, lathered it around in my hands, and then shampooed as normal. Voilà! The greasiness was gone! There are several of variables you can play with. You can use apple cider vinegar, or white vinegar, both work equally well. For me, however, the white vinegar smelled less. I could only smell the vinegar on my hair when it was wet, and even then other people never noticed. If you're concerned about the smell, however, you can add a drop or two of orange essential oil into your vinegar and water mix, and then your hair smells like yummy citrus. Another choice is to use lemon juice instead of vinegar. However, preservative free presqueezed lemon juice at the grocery store is a little more pricey than vinegar. The last, and my favorite option, was discovered by my wonderful friend, Caroline. She was attempting the soap shampoo experiment too (and loves it, without any baking soda!) and found out that Dr. Bronner's makes a citrus conditioning hair rinse! (for bay area locals, it's available at Berkeley Bowl). Dr. Bronner's uses lemon juice combined with shikakai powder to thicken it into a consistency more similar to the conditioner that you're used to. While this might be more expensive than the vinegar, it ensures that your hair will smell absolutely delicious. There are a lot of other options for soap based shampoos at Whole Foods and other local natural food stores, just look for a shampoo that only uses saponified oils. 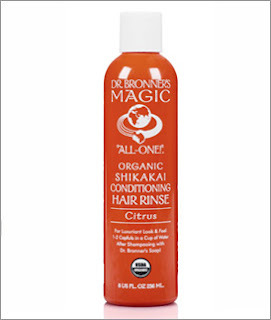 You can even use Dr. Bronner's liquid soap (which is carried nationwide by Whole Foods). Everyone's hair is different, and everyone's water is different, so this method may have different results for each of you. If you want to try your own soap shampoo experiment, give it a go, and share your results in the comments! For those of you who may be a little less adventurous (or have very hard water), I have a detergent shampoo guide coming soon! Saponified oils of coconut*, olive* & jojoba*, lemon essential oil*, vegetable glycerin, guar gum, sweet almond oil, jojoba oil*, rosemary extract. *Certified organic ingredient. Lemon juice*, shikakai powder*, coconut oil* **, potassium hydroxide, olive oil* **, hemp oil*, jojoba oil*, lemon oil*, orange oil*. *Certified organic ingredient. **Certified fair trade ingredient. I used Dr. Bronner's soap mixed with baking soda plus a vinegar rinse for the first time yesterday. It worked great! Soap shampoo takes some experimentation. Has anyone else tried it yet? I've got to try that magic leave-in conditioner! It sounds awesome. You absolutely should, Char! My hair is getting so much thicker and growing so fast. People keep asking me if I've colored my hair or had it cut! I've never been complimented so much on my hair :P It's so soft now too. You've gotta try it!! I need to get these products! I'm currently using Acure Organics for dry/curly hair, but my curls left after I had my baby. It's just a bunch of weird waves that look horrible. Definitely try them! I've just started using the shikakai rinse and it is incredible! It gives my hair more curl and body. A review will be coming shortly. Keep your eyes peeled. I have soft water and tried Dr Bronner's Shikakai soap as the shampoo and found it was really difficult to get my scalp clean. I was scrubbing so hard that I now have a bunch of breakage at the scalp. :( I used the Conditioning Rinse but found that it left the hair closest to my scalp too greasy even after rinsing it with water so I omitted that and tried using my old conditioner (Nature's Gate Biotin) but had the same grease problem. So for the past week I've just been using the Nature's Gate on my ends. My hair is still pretty greasy so I've gone from washing twice per week to daily or every other day. Since the hair closest to my scalp is probably too basic from not using a rinse, perhaps that contributed to the breakage with all the scrubbing. I've used white vinegar before Dr Bronner's and found it too strong-smelling (even my husband admitted to keeping his distance from me!). It's been about 3 weeks since I transitioned but, while I wasn't using products with waxes and silicones before that, my hair was over-conditioned from using conditioner only (called co-wash for curly-haired folks) so I'm not sure if the normal transition period applies. Any recommendations on where to go from here? I was thinking of trying the non-harsh detergents in Aubrey, thinking they'd strip the oil better and eliminate the need to scrub so hard and cause all that breakage. Then I wouldn't need the problematic acidic rinse either. It can take longer than 3 weeks for the transition sometimes. Also, I thought I had soft water, but when I checked with the local water utilities I found that there was a higher level of calcium than other minerals. Calcium is the worst offender when it comes to mineral deposit in your hair. These mineral deposits leave that greasy residue. Try waiting a little longer for the transition, and don't scrub your hair so hard that it breaks! Just tie it up in a ponytail and try to be patient (I know it's hard!). And in the meantime, check with your local utility.